With more than 290 stores nationwide and departments in women, men, children, accessories, swimwear, outerwear, loungewear, wedding, bags, sweaters, denim, and petite, this store has sporty, fashionable clothes for almost everyone with a particular emphasis on young ladies. With a J. 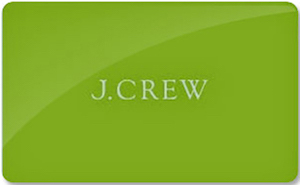 Crew gift card from Cards2Cash, you can add lots of style to your closet for less money! After opening their first store in 1989, their fresh, sporty interpretation of fashion quickly caught on with the younger crowd, and in particular, with the young ladies. “We side with style over fashion” is their motto and boy do they deliver! Once you shop here, you will understand that some stores just have a style of their own. Purchase a J. Crew gift card from Cards2Cash, and you can save a good deal of money and look great doing it! At Cards2Cash we understand how difficult it can be to save a few dollars. And believe me, we know that every little bit helps. When you buy a J. Crew gift card from Cards2Cash, not only do you save money immediately but because gift cards are a form of currency, you can still use any coupons or promotions that you may have- the savings are endless! And don’t forget, a J. Crew gift card makes an ideal present too! Cards2Cash works to supply a variety of discounted gift cards for everything from grocery stores to pet stores. Make sure you check out our listings for Hot Topic, Express, REI, and more! With Cards2Cash, saving money is easier than ever before! Do you have a J. Crew gift card you aren’t going to use? Cards2Cash will turn your unwanted gift card into money! We pay high dollar for unwanted gift cards for a variety of shops from restaurants and Clothes shops to hardware stores! Just visit one of our retail locations to receive money on the spot for your unwanted card OR fill out our simple online form, and we’ll make you an offer you can’t refuse! Whether you buy a gift card from Cards2Cash or sell us one, we will give you the best possible price!